During the 1950s the Netherlands was famous for having two foreign ministers. When asked to explain this curious situation, one of them, Joseph Luns, is said to have quipped: Als klein land heeft Nederland heel veel buitenland. (‘As a small country, the Netherlands has a great deal of foreign parts’). That the Dutch have become more inward-looking in recent years is reflected in the fact that the country currently has two governments, both concerned mainly with domestic issues and conjoined by a shared prime minister, Mark Rutte. On the one flank there is Rutte-II, the partnership forged in adversity of the right-wing Liberals (VVD) and centre-left Labour party (PvdA). It drove through a package of reforms to lift the economy out of the mire of the banking crisis, but at the cost of the near-annihilation of the PvdA, which now finds itself detained in the corridors of power like a spurned husband who can’t afford to move out of the marital home. However, the general election in March left the political landscape so fragmented that only a coalition of four parties could secure the working majority Rutte craved. Nearly six months later, Rutte-III remains a government in waiting whose chief merit is that there is no viable alternative. In his quest for stability, Rutte is relying on a hybrid vehicle with complex ideological fault lines on immigration, on climate change and on medical-ethical issues, as well as the slightest of Parliamentary majorities. Those fault lines were brought into sharp focus by Christian Democrat leader Sybrand Buma’s HJ Schoo lecture earlier this month, in which he positioned the CDA as the new home of Christian conservative nationalism, a world away from his progressive liberal coalition partners in D66. The welding together of Rutte III has been such a slow-drip process that its predecessor is now the longest-serving government in Dutch democratic history. While the coalition-in-waiting has been tying itself in knots over marginal issues such as embryo research and whether children should learn the national anthem in school, it has been left to the departing ministers to sort out the heavyweight issues. Labour leader Lodewijk Asscher, who is simultaneously operating as deputy prime minister and the incoming cabinet’s most effective opponent, has used the threat of teachers’ strikes to wring a promise from Rutte to raise wages for primary school staff. An extra €145 million has been earmarked for extra personnel in the care sector, another €50 million for asylum and migration. Two weeks ago the defence and international development ministers committed the funding for Dutch troops to spend another year on their top five military missions, on the basis that waiting any longer might unsettle the troops. Caretaker governments are supposed to limit themselves to non-controversial issues, and while defence spending might seem beyond reproach in the current security climate, it’s worth remembering that Rutte’s predecessor, Jan Peter Balkenende, was brought down when his last cabinet split over the Dutch military presence in Uruzgan. 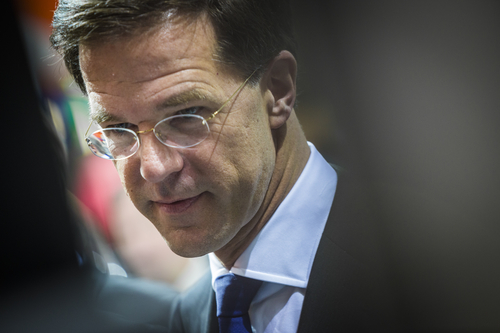 The longer it takes for Rutte’s third cabinet to take shape, the more it starts to look like a missed opportunity. The recovery of the economy, which generated a budget surplus of nearly €3bn in 2016, has given the government the luxury of having extra cash to spend for the first time in a decade. Yet the budget for 2018 that will be announced in the third week of September has been written by Labour finance minister Jeroen Dijsselbloem, and although the expectation is that many of the measures will be modified or abandoned, in practice it is difficult and potentially disruptive to deviate from a preset course. The ‘spring accord’ drawn up in haste and under financial duress in 2012 following the collapse of Rutte’s first cabinet included such measures as accelerating the increased pension age, lifting the upper rate of BTW to 21% and restricting eligibility for mortgage tax relief, all of which were carried forward by Rutte II. The recent court ruling requiring the government to revise its air pollution strategy is a further snare on the pathway that the old government will have to untangle. The court gave ministers just two weeks to come out with an outline plan, too little time to wait for the new coalition to take action. So the outgoing junior environment minister, Sharon Dijksma, will have a big influence on the policies of the new dedicated environment ministry, which will be under pressure to make swift progress on meeting the court’s demands. It doesn’t help that the environment is one of the main bones of contention within the new partnership, with Buma’s CDA at odds with D66 and, to a lesser extent, Rutte’s VVD on the pace and scale of the measures needed to mitigate climate change. Conventionally outgoing governments are hamstrung by indecision and mistrust while their successors exude purpose, energy and confidence. For the Netherlands’ two governments the roles appear to have been reversed. As the coalition talks grind on Rutte is in danger of discovering that not only has he been overtaken on the inside lane by his old administration, but the strain of trying to make up the ground may send the wheels spinning off his new vehicle.